These brief allusions, mentioned only in passing, and so typically Machenesque, have always appealed to me. Whenever I searched, however, for further information on the J.H.V.S. Syndicate, I could find nothing more. 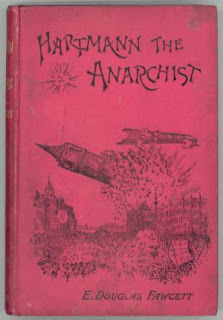 I wondered if perhaps, after all, this was just a picturesque fiction by Machen, or he had changed the details. But one day earlier this summer I had gone to visit friends in Todmorden, a town in the Pennines that lies awthwart the borders of Yorkshire and Lancashire: the local legend has it, indeed, that the boundary line goes right through the middle of the imposing stone temple of a town hall there. The friends in question are the composers and musicians behind the beautiful and mysterious work issued under the name ‘watch repair’. Before I went to see them, I called in at the town's Border Bookshop. Upstairs, in a room overlooking the street, was an entire wall of cricket books. Now it must be admitted that there are not all that many books on cricket that might be classed as literature. The works of Cardus, and Allott, of course. But the (often ghost-written) memoirs of past players, or accounts of forgotten tours and test matches and controversies, do not often have a lingering charm. However, sometimes odd and unusual volumes may be found. 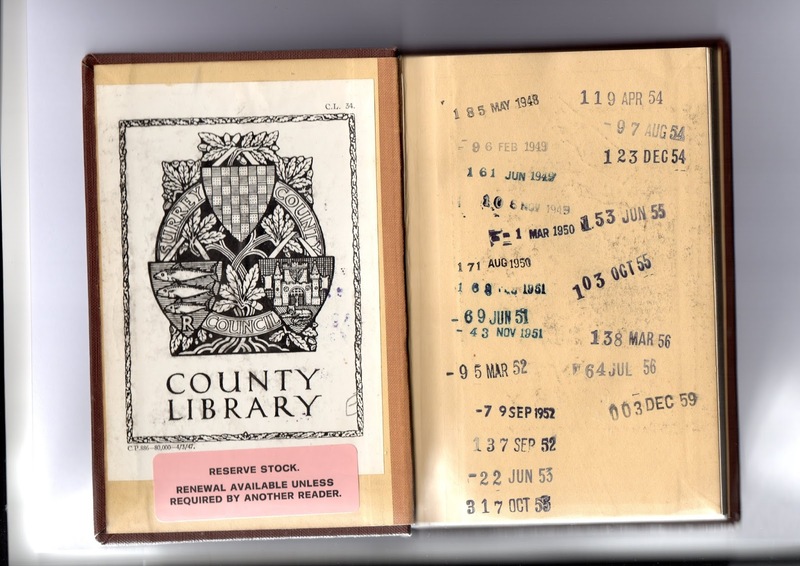 Here, for example, was a notebook with, on the cover, the handwritten title 'Cricket Records', the signature of J E Simpson, and a sketch of a pair of wickets. Inside were pasted scorecards and tables of averages clipped from 1890s newspapers of matches played by Norbury Park, for whom the compiler played. And here it was too that I chanced upon Autumn Foliage (1935), the memoirs of Lt Col Cyril Foley, Cambridge and Middlesex. Foley, the son of General Sir St George Foley, a Governor of Jersey, was described in obituaries as ‘Elizabethan’ in his range of accomplishments, and also enjoyed madcap exploits, including sliding down a Swiss mountain on the seat of his trousers, seen to emit sparks. Something about the punning and poetic title of his book drew me to look at it more closely. Amongst highly conventional chapters headed Eton, Cambridge, Golf, Shooting, Racing, Fishing, and Billiards, the Great War, and Monte Carlo, I saw with delight one breezily entitled ‘The Ark of the Covenant’, as if this were a perfectly natural pastime or accomplishment alongside the others. And sure enough, here was an account of an Edwardian expedition to Palestine to excavate for the Ark. As I glanced through this, it seemed tolerably clear that this must be the matter that Machen had mentioned. The book had clearly been waiting patiently for me to come along so that it might provide at last the long-lost explication of the J.H.V.S. Syndicate. 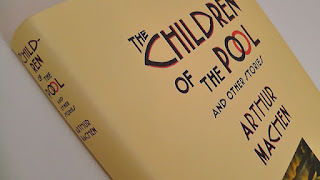 The author explains that a syndicate had indeed been set up (he does not give it this name) to attract investors to fund the mission, based upon some reinterpretation of biblical passages by a Danish scholar. The appeal was a great success: in fact, he says, they could have funded it several times over, and had to turn away would-be backers. His own involvement had come about through a friend-of-a-friend, and he had accepted the invitation out of a sense of adventure. It was the sort of offer that does not come along very often. He describes the excavations in some detail, including the delicate discussions with Ottoman officials and local religious leaders, so as not to offend sensibilities (not wholly successful), the engagement of a workforce, and an account of a perilous descent he and others made into certain deep shafts and along narrow tunnels. They began with high hopes and an atmosphere of excitement: but as the hot days passed, things became more troublesome, and trust in the quest began to wane. At last, they decided to draw stumps. The Ark was not there, or was not to be found. With a concluding flourish, however, Lt Col Foley consoles himself that, on a day off, they did get up a game of cricket. He remarks that he may well have been the first to have scored a six into the pool of Shiloh. There is an element of waggery in the universe, Machen once averred, and I think it was on display when I found the best description yet of what surely must be the J.H.V.S. Syndicate concealed in a cricketer’s memoirs amid tales of billiards and Monte Carlo. Robert Player was an architect, and later lecturer on architecture, but also the author of a handful of eccentric novels, published by Gollancz, which I suspect have an oblique cult following. The best is probably the earliest, The Ingenious Mr Stone (1945), a murder mystery, but told in a particularly sly and mannered style. 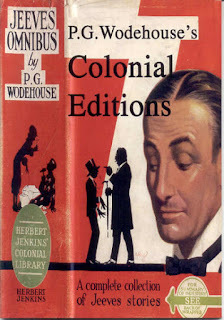 There is a tinge of Firbank in the characters and settings. Also notable is Let's Talk of Graves, of Worms, of Epitaphs (1972), a story not dissimilar to Baron Corvo’s Hadrian VII in plot, nor indeed in its somewhat rococo prose. 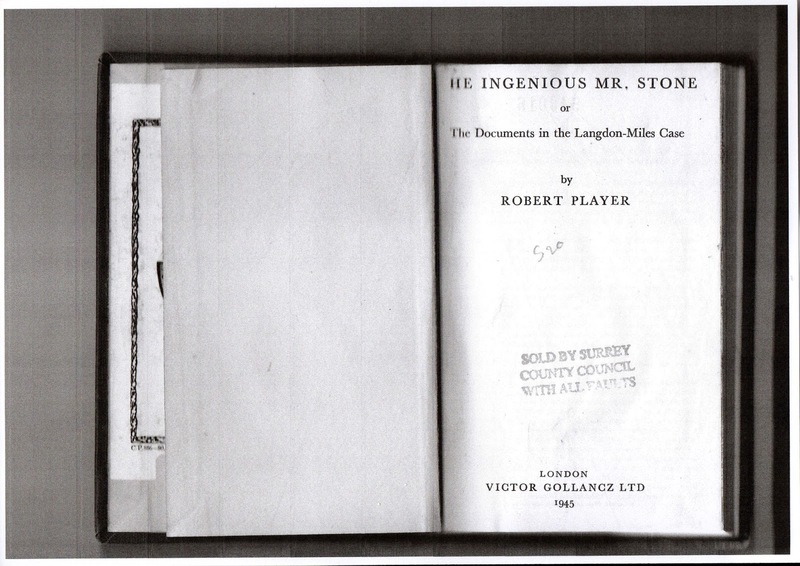 The copy of The Ingenious Mr Stone illustrated here has been discarded by Surrey County Council library, but still bears on its front free endpaper what ought to be date-of-return stamps, denoting a certain amount of popularity for the book in the period 1948 to 1959. The stamps are in chronological order, and do seem to represent a series of issues of the book to readers. When I looked more closely at them, however, I noticed something odd about the dates. 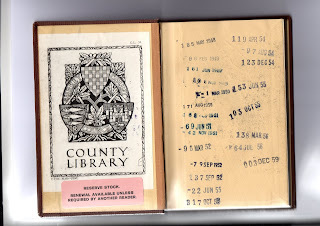 If their purpose was, as is usual, to remind a reader when to return the book, they might have caused some confusion. They seem to refer to dates in a rather different calendar to the one commonly in use, certainly in Surrey: for example, the 95th March, the 137th September, the 317th October and the 123rd December. Only a few seem to conform to more normal usage: there was, apparently, even in this realm of long Septembers and even longer Octobers, still a 22 June and a 3 December. It is difficult to avoid the impression that some library assistant, or possibly even the librarian themselves, has run amok. Perhaps, bestirred by the bizarrerie in Mr Player’s book, they were moved to add their own fantastical dimension to the volume. Or possibly, unbalanced by the complexities of the plot, they simply seized the date stamp and wielded it with cavalier abandon, spinning its cogs at random, while (with some vestige of order still clinging to them), preserving a sort of chronology. Alternatively, perhaps in some unregarded nook of the county library in Guildford, there was then (and may still be) an old oak door said to lead to a store-room for unwanted books, but in fact, under certain circumstances, giving onto a world where the months do just as they please, continuing for longer and longer, and all the calendars come with a sheaf of extra pages, just in case. Who then, we may well wonder, was reading or returning The Ingenious Mr Stone, beyond that threshold, on the 95th of March? These carved or inscribed words or symbols are, as he says, marginal in every sense and have not until recently attracted much attention, This might be due originally to an intellectual disdain for this crude and seemingly casual craft, or to the richness of other forms of art and symbol in our churches demanding higher attention. But there are also practical difficulties in pursuing the study. Much graffiti will only show up in a certain light, or shade, and it is sometimes in furtive, rather inaccessible places. Even when it is found, it is often difficult to read, if text, or to interpret, if symbol. Champion quotes “a tiny inscription in St Mary’s church in Ashwell” (Hertfordshire) which has a clear date, 1381, but goes on to say that whereas “the noted church historian M.R. James” interprets it as referring to the Peasants’ Revolt, other authorities think it refers to the exchange of some ploughlands or the completion of the church rebuilding. However, as the epigraph from M R James (1895) on pg 2 of the book, also quoted by Violet Pritchard, reminds us, ‘The more closely we study the remains of early sacred art, the more frequently do we detect the smallest details have a meaning…’. Some scrawlings are of course, as today, the signs of profane amusement by the bored or mischievous. Even games, such as Nine Men's Morris, can be found burrowed into stone or wood. But there is much else that seems to link to folk belief. 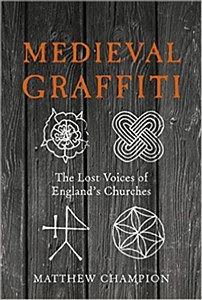 The majority of this graffiti seems to be apotropaic, that is, intended as a form of protection – if so, a remarkable example of popular magic persisting even within the hallowed walls of the church. But Champion reminds us that folk ritual was a common part of the year’s round in the church – with such customs as blessing the plough, beating the bounds, circling the church, having a liberal mixture of pagan practice within them – so these carved marks are not quite in such a contrast to the sacred services as we might suppose. I would add to this that ritual marks are also found in historic timber in secular buildings, such as old manor houses, farmhouses, or barns, often carved by carpenters on roof beams or doorways and supposed to be there to ward off evil or to invoke blessings. These, too, have not been significantly studied, apart from one particular monograph, ‘Ritual Marks on Historic Timber’ by Timothy Easton (Weald and Dowland Open Air Museum Journal, Spring 1999). Some of the same shapes and signs carved in churches are also found in secular buildings. Crude signs, mostly: M, W, an X between doorposts |X|, which possibly suggests Christ guards the threshold, the Chi-Ro, rarely a Y [Ygdrassil? ], these all sometimes so strewn and so slashedly hewn that they might appear casual or accidental, as indeed some people do think they are. Yet there are also more elaborate symbols, clearly marked by intention, such as labyrinths. Sometimes only strong light, chalk or charcoal rubbings fully reveal them. Some are hidden on parts of the timber never usually seen. And what if some were not wards and sealings, but invitations and openings? Ronald Hutton in The Pagan Religions of the Ancient British Isles (1991) noted that while cave paintings of animals have had a lot of attention, the more numerous geometric symbols have not, because harder to interpret. By analogy with surviving tribal societies, these might be spirit maps of supernatural journeys, he suggests. The same point might be made about these ritual marks. We don’t know what they are, what they mean, and so they are left largely unstudied. The larger point is that our understanding of non-textual religion and belief may be seriously skewed. We see it through what we already know: what we don’t know may be much more important.